I found this dog-day cicada on our driveway. It was sitting still, but fluttered a little when I picked it up. I put it in a ziplock bag so my kids could take a close look at it. Then, since it seemed cooperative, I set up my homemade photo studio (the one inside my house, not my wheelbarrow) and took a few photos. 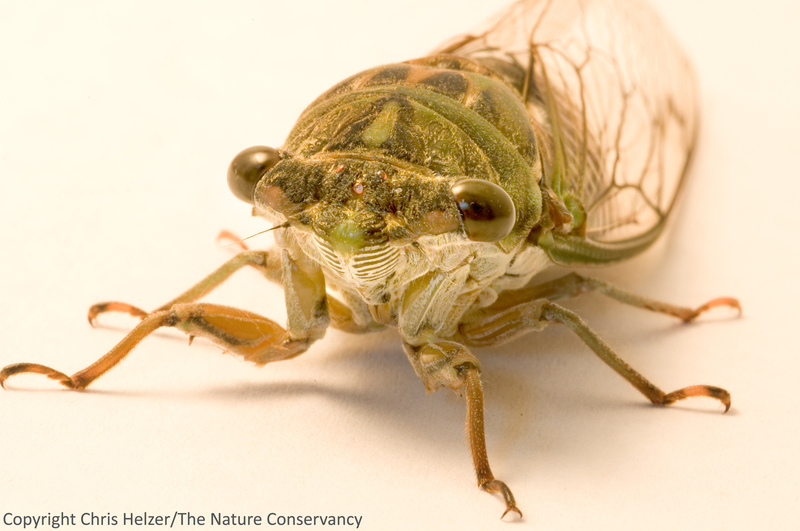 Cicadas are fascinating creatures when seen up close. Can see you see all five eyes? There are two big compound eyes on the sides of the head, of course, but also three simple eyes arranged in a triangle near the center of its head (they resemble little red/orange beads). Click on this photo for a much larger and sharper view. The cicada sat completely still as I began photographing it, and even let me arrange its legs a little. After a few minutes of photography, though, it started getting a little more lively. Before I knew it, it was buzzing around my kitchen, and I was trying to chase it down and catch it in a small ziplock bag. (Why are you laughing??) When I took it outside, it flew off, looking completely happy and healthy. This entry was posted in Prairie Insects, Prairie Photography and tagged cicada, close up, macro photography, nature photo, photo studio by Chris Helzer. Bookmark the permalink. It’s quite clear why, when one of these things lands on your neck, that personal pandemonium is the most likely response. My home farm in Nebr. had a grove of black walnut trees, planted by my grandmother and great-grandmother, and the grove was very popular with cicadas. Loved hearing them sing on hot afternoons and into the evenings. I played gently with them when I found one crawling on the tree; let them crawl up my arm, and never harmed them. Too interesting and valuable. Thanks for the memory, Chris.